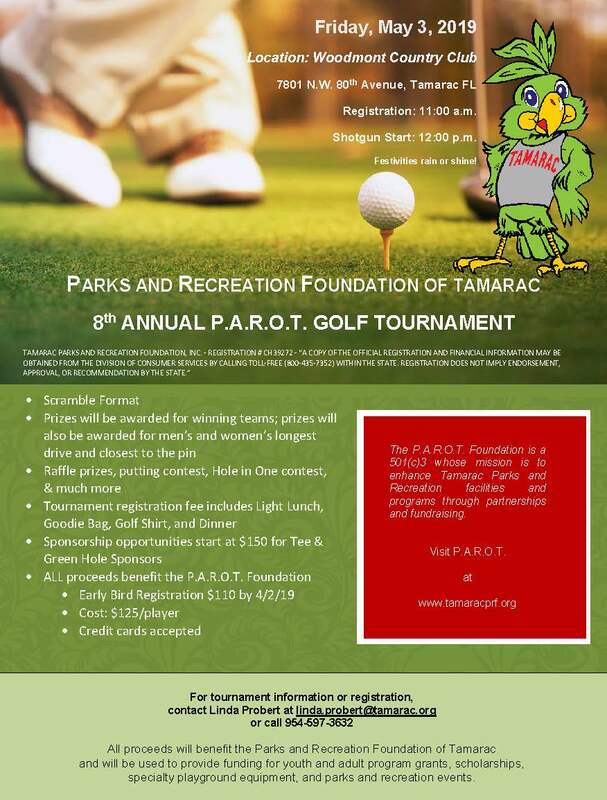 Please join the Parks and Recreation Foundation of Tamarac for their 8th Annual P.A.R.O.T. Golf Tournament on Friday, may 3, 2019 at Woodmont Country Club, 7801 N.W. 80th Avenue, Tamarac, FL. “Fore” more info, please see the flier. Make note early bird registration ends 4/2/19. Congratulations are in order for L’nique Noel and Destiny Rochester, the 2018 Memorial Scholarship Recipients for summer camp staff. L’nique is a student at Savanah State University and Destiny will be attending Harvard University in the fall. Each recipient received $1,000 towards their college expenses at a special awards ceremony on August 6, 2018, at Tamarac Park where both of these outstanding young ladies work for the Tamarac Summer Camp program. The Libio-Carr-Boos Scholarships are in memory of three outstanding individuals who the City of Tamarac were lucky enough to have as summer camp staff members and youth program volunteers. The Parks and Recreation Foundation of Tamarac has funded three $1,000 scholarships annually, honoring Cenzo, Morgan and Kevin. Two of the scholarships are awarded to current year Tamarac summer camp staff attending college and one is awarded to a graduating Taravella High School student. 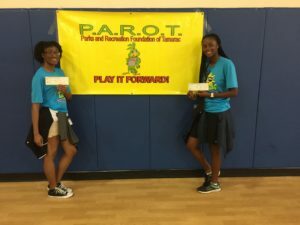 The Operation Swim even held on Saturday, May 19, 2018, was sponsored by P.A.R.O.T. 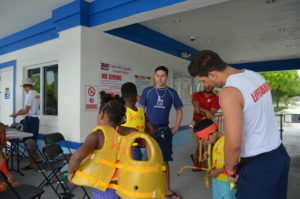 The event featured water activities, learn to swim techniques, survival basics, and more. Dedication of a the new scoreboard at the Caporella Aquatic Center was held during the a spring Splash Bash event. The Splash Bash was held on Saturday, April 7th, from Noon to 4:00 p.m. with the scoreboard taking place at 12:30 p.m. 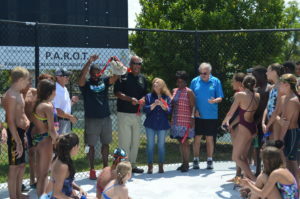 The Parks and Recreation Foundation of Tamarac purchased and donated the scoreboard which will be used during swim meetings, by the Tamarac Swim Team, and during other special events. Please make plans to join us on Friday, May 4, 2018 at Woodlands County Club, 4600 Woodlands Blvd., Tamarac, FL. Registration at 11:00 a.m. with a Shotgun Start at 12:00 p.m. Festivities Rain or Shine! For tournament information or registration, please contact Linda Probert at 954-597-3632. The P.A.R.O.T. Foundation is a 501(c)3 whose mission is to enhance Tamarac Parks and Recreation facilities and programs through partnerships and fundraising.The funds raised will provide funding for youth program scholarships, playground equipment, and parks and recreation events.